Auto Blueberry Domina delivers very generous yields within a very short time. This Indica dominant variety has been created by mating Blueberry and Black Domina and then adding Ruderalis to the blend. The result is an autoflowering variety that rushes through its flowering time within only 45-50 days. At the end of its life cycle each plant carries 110g of thick flower clusters. 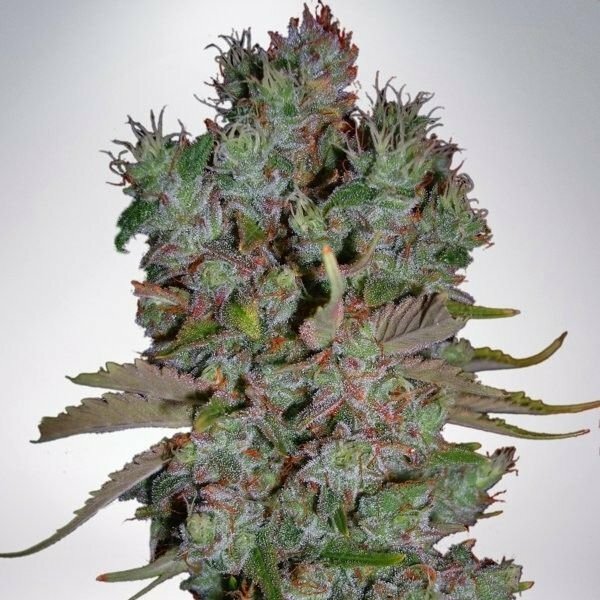 Auto Blueberry Domina is an Indica dominant variety, created by mating Blueberry and Black Domina and then adding Ruderalis to the genetic mix, resulting in a plant with only 10% Sativa influence, 70% Indica and 20% Ruderalis. Looking at the broad fingers of the leafs and feeling the intense body numbing effect it becomes obvious that Black Domina dominates this variety (how fitting, she is used to dominate). These feminized Auto Blueberry Domina seeds are suitable for outdoor, indoor and greenhouse cultivation and deliver very generous yields within a very short time. The plants hurry through their flowering time within only 45-50 days and produce incredibly fat columnar buds covered in a layer of sticky resin. In an indoor plantation you can expect a harvest of 110g per plant, respectively 220g per plant outdoors. Apart from the high yield, neither is Auto Blueberry Domina miserly in regards to potency or quality. She boasts with a high quality end product with the pleasant flavor of berries and a hashy aftertaste and 17% of the properly cured loot is pure THC. The smoke of Auto Blueberry Domina triggers a sweet cerebral kick, paired with a very relaxing effect. Savored in higher doses this relaxing aspect outweighs the cerebral effect and makes you look for the next couch to rest your numbed body.